After the ’40s, Universal Pictures had to upgrade the horror beyond Dracula, Frankenstein’s Monster and the Wolfman. They hit success in 1954 with The Creature From the Black Lagoon so they kept going for this next generation of nightmares for teenagers of the atomic age. What if a movie explored a strange element of science that had been widely debunked. What if the Earth was hollow? The Mole People opens with Dr. Frank Baxter of University of Southern California discussing geology and the hollow world theory. He shows how the world is like onion layers with space between the layers until you get to the solid hunk of rock at the center. The problem is that Baxter taught English so ultimately he brings zero credibility as he gives a TED Talk about stuff he never really explored. But he sells it like any actor hired to play an expert in a movie. Perhaps Baxter is what has inspired the wave of bogus expert pundits that waste time on various news channels. The concept sets up the exploration in the movie. Archaeologists Dr. Roger Bentley (Revenge of the Creature‘s John Agar), Dr. Jud Bellamin (Leave It to Beaver‘s Hugh Beaumont) and Prof. Etienne Lafarge (Creature From the Black Lagoon‘s Nestor Paiva) are digging in Asia when a kid gives them artifact that he found high in a mountain peak. They believe it is from a lost culture that just vanished. So they climb up and up into the snowy peak until they come upon a tiny place with a door that opens into the mountain. They lower themselves down into what turns out to be a complete underground world. This is where they encounter two races living in a not so happy way. The Sumerian are albinos that were the humans that fled underground. The Mole People are humanoid moles that have been enslaved. The Sumerian think the archaeologists are gods because of their special flashlight. While most of the Sumerians are extreme pasty, Adad (Cynthia Patrick) is normal looking which means she naturally becomes an object of lust by Dr. Bentley. Things get tense fast and the scientist have to figure out what to do before they get stuck in the underground world. 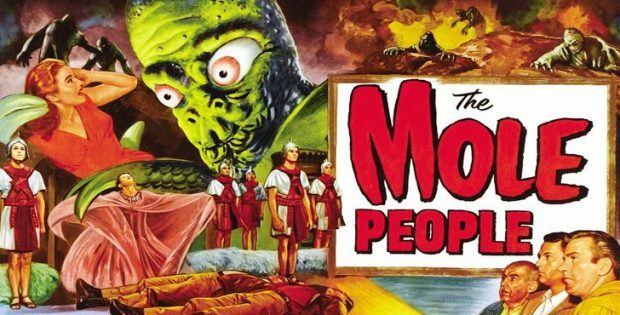 The Mole People is a good mix of horror and science fiction. The Mole People became almost a new version of Frankenstein’s Monster since they aren’t really as evil as you think they should be. Like Dr. Frankenstein, the Sumerians are the true evil even though they are led by none other than Alan Napier (Alfred on Batman). Agar and Beaumont make a good looking pair of archaeologists. Although you will keep making Beaver jokes when Hugh is on the screen. Even with it’s warped sense of science, The Mole People keeps things entertaining no matter how deep into a hole the action goes. The video lets you choose between watching the film 1.85:1 or 2.00:1 anamorphic. The transfers are once more a major upgrade over the previous DVD release. You’ll be able to enjoy the detail of the Mole People masks. The audio is DTS-HD MA mono. You’ll hear plenty of whipping. The movie is subtitled. Audio Commentary with Tom Weaver, David Schecter and Jan Alan Henderson is a more serious version of the MST3K commentary. They discuss the elements of the film and the actors. Of Mushrooms and Madmen: The Making of The Mole People (18:40) goes deep in how producer William Alland worked at Universal. Historian Tom Weaver and Bob Burt (Ghost Busters) talks us through how the studio realized they could save a lot of production cost by using stock footage. They discuss how director Virgil W. Vogel had stepped up from editor. Mystery Science Theater 3000 episode (92:00) is from 1997 when Mike was being chased by Pearl in her VW Microbus. The apes are celebrating Lawgiver Daze with Pearl on the float. Amazing to to think that for a generation of kids, this was their first introduction to Mole People until Svengoolie showed up on MeTV. This is in standard definition, but the transfer looks fine. Posters Lobby Cards Gallery (4:33) has all the numerous ways they attracted above ground eyes to the film. They include international posters. Photo Gallery (4:16) has an amazing selection of movie stills and behind the scenes fun. Trailer (2:00) scares us with a creature crawling up from the bottom to attack us. Scream Factory present The Mole People. Directed by Virgil Vogel. Screenplay by: Laszlo Gorog. Starring: John Agar, Cynthia Patrick, Hugh Beaumont, Nestor Paiva & Alan Napier. Rated: Unrated. Running Time: 77 minutes. Released: February 26, 2019.